Most libguides are a waste of a time. They do little more than replicate what can be found on Google and in the library catalogue, yet subject and liaison librarians spend an extraordinary amount of time creating these dull discursive beasts. Year after year we continue to tinker with them in the hope that this will be the year that others realise they are not such hideous creatures after all. Libguides in and of themselves aren’t bad. They are useful tools for filtering the abundance of information about a particular topic. Libguides are also useful for conveniently locating relevant information in one place and for organising information so students can skip to the bits that interest them most. But for students wanting instant satisfaction, as so many do, Google, Google Scholar and every other search-like algorithm does all these useful things so much better than any libguide could ever hope to do. 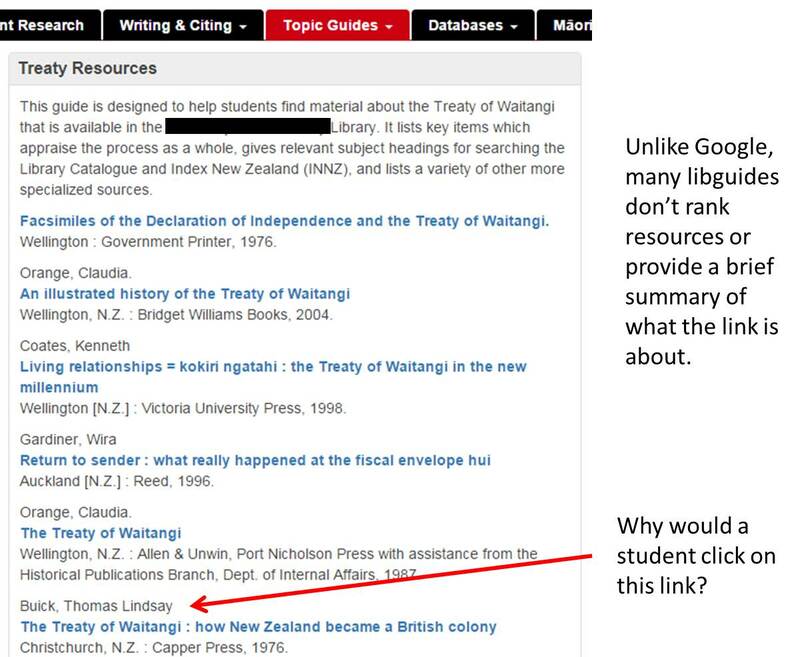 Most libguides don’t even go so far as to rank or include simple summaries for the links they provide making it even more difficult for a student to decide what is important or relevant. Libguides also tend to be subject-based rather than course-based and as a result it is unlikely that valuable resources relating to a Project Management course will be highlighted in the Business libguide. Have you also noticed how many libguides are organised by format with tabs for books, journals, websites etc? How likely is it that a student will click on every single tab to see if it contains information relevant to their assignment? As librarians we know that Google (and every other search-like algorithm) doesn’t do the whole job; that a good librarian can find what Google can’t. So why don’t our libguides take advantage of this? Why do our libguides fail to flaunt the expertise of the librarian? One reason (and I know you’ve heard it before so I won’t labour the point) is because as librarians we are crap at promoting ourselves. Another reason is that we’ve gotten ourselves into a habit that even though we know a libguide is ineffectual, the alternative of either not creating libguides or re-imagining them so they provide better value for students is just too hard to contemplate. A third reason is that some of us are reluctant to publish our recommendations or suggestions let alone our preferences or opinions. Instead we prefer to allow students to make their own decisions from the plethora of choices we provide just in case our opinion of a book, journal, database or website comes back to bite us on the bum. Unfortunately, students are no longer satisfied with text links and obliquely recommended results. Finding, filtering and organising information is no longer enough to attract attention or add value. Students are interested in what we think, why we made the choices we did and reducing the abundance of information even further with smaller selections of carefully chosen offerings. They’re interested in someone they trust putting information into context and telling them what they should go for. Libguides not only need to find, filter and organise but they also need to recommend; to show our expertise as subject librarians. Libguides should express a human element. A human take that says ‘Hey here’s why I think this is interesting; you should check it out for yourself’. We need to balance what we already do with our expertise, knowledge and interest of the subject. Our challenge is to use libguides to create the right blend of resources that will be the most relevant, useful and valuable for students. If we are going to persist with libguides, let’s at least create libguides that put the student first, not the resources. Holy guacamole, that picture is disturbing at high resolution on a large screen!!! Is that an Orc? Sally I couldn’t agree with you more. It’s about building that trust and helping people cope with information overload! What’s more, it’s also about understanding the psychology behind why LibGuides don’t work as much as we like them to!